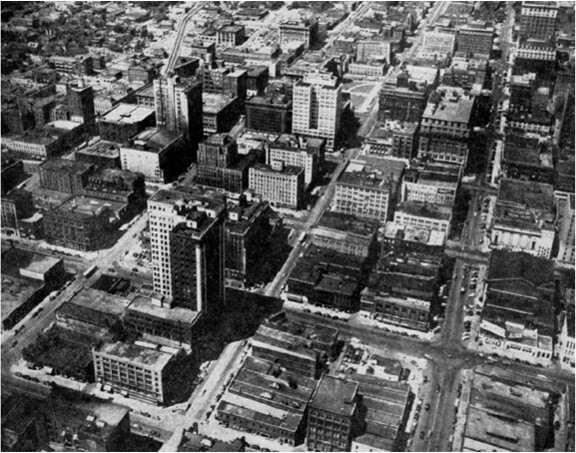 During the summer of 1947, the Omaha World-Herald published a series of 45 aerial photographs depicting the city of Omaha. 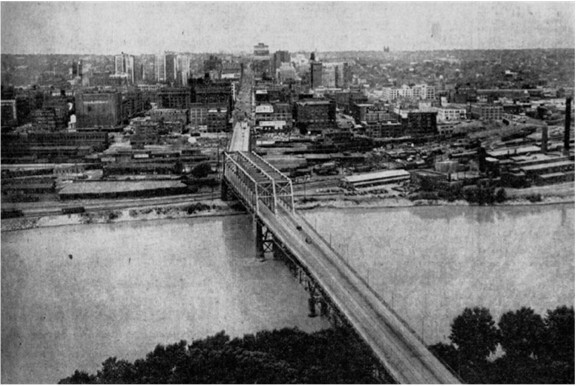 The pictures were later published in a book entitled Omaha From the Air. The photographs were taken by World-Herald staff photographer John S. Savage. The plane was piloted by Marion Nelson of the Omaha Aircraft Company. The text presented below is that which appeared as captions for each of the photos, which are also linked below. The forty-five aerial photographs are presented in four, separate galleries and are approximately 80-100K each. The magic carpet flies over the second of Omaha's two great public housing projects. This is the South Side Terrace Homes, operated by the Housing Authority of the City of Omaha. You are looking north and slightly west. The street running upward to the right is Twenty-eighth Street. It intersects with W Street near the lower edge of the picture. The long shed paralleling Twenty-eighth Street is a catlle run, overpassing the intersection. The housing project, located on a gently sloping plot of ground, is bound on the north by R Street and on the west by Thirtieth Street. In the foreground is the smokestack of a boiler plant that furnishes heat to the 54 buildings of the project. These buildings, divided into 522 apartment units, now house slightly more than two thousand persons. 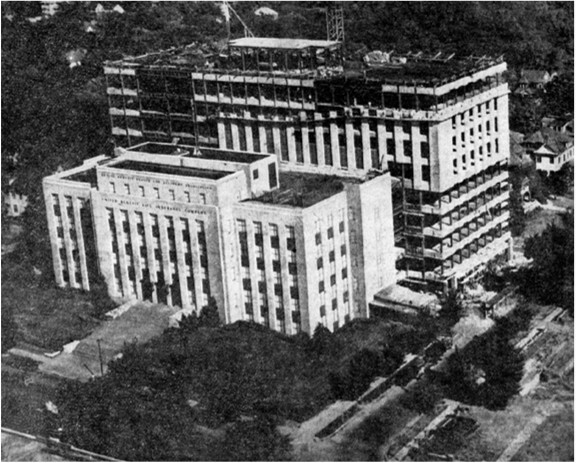 The South Side unit was opened April 1, 1940. Cost of construction was slightly over two and one-half million dollars, provided by the Government. The South Side Terrace operates under the same rules as the larger Logan Fontenelle unit - maximum income, $2,200 per year for a family of four or more, maximum rent $34.50 per month. If a family's income exceeds this amount, the rent is raised to $40.50 and the family is asked to find other quarters. In the background are several of the big packing plants, whose employees make up most of the project's population. The Magic Carpet pilot makes a banking turn as you speed north. Now you are looking east at the sprawling plant of the 14-million-dollar former Martin-Nebraska Bomber Plant. Airplanes are not being made there now. The Allied Packaging Company of Cleveland, O., is putting plane-making tools in moth balls. The work is part of the Army Air Forces' Air Materiel Command project to see that this country is prepared should it again be attacked. You are looking down at the birthplace of 1,585 B-26 Marauder planes and where 531 B-29 Superfortresses were born. Among the B-29s were the two which dropped atom bombs on Hiroshima and Nagasaki, Japan. The broad strip in front of you is a four-lane highway to the plant. The large structure at upper left was the Martin engineering building. Nearby is the office building. Both are connected to the main plant by overhead ramps. Still looking east, the main assembly section is at the far end of the big plant. The wing assembly section was at the end nearest the Magic Carpet. The building standing alone in the foreground was a paint and camouflage shop. It was used chiefly in the days of building B-26s. In November, 1943, employment in the Martin plant reached a peak of 14,572. Seventy-five per cent of the employees were from Omaha and Council Bluffs. The other 25 came from every state, Alaska, Cuba and the Philippine Islands. Ground was broken for the main plant March 3, 1941. Martin-Nebraska started making B-26s January 1, 1942. There are 48 buildings covering two million square feet in the assembly plant and hangar area. At the far right, in the background, are two modification buildings. They were among eight covering 750 thousand square feet in the area which saw changes made on more than three thousand aircraft to fit them for battle conditions. 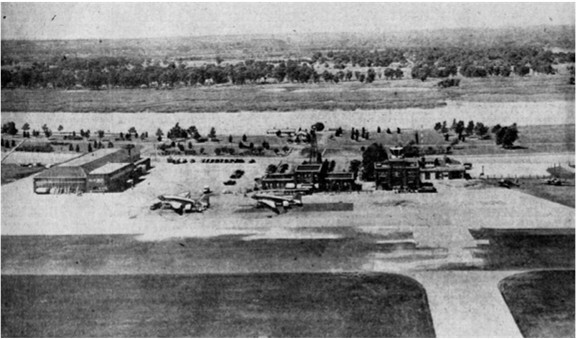 At the right are buildings now used by the Second Air Force. In the right foreground are control tower and hangars. A part of the Fort Crook reservation is visible at lower right. A total of 1,600 firms contributed to the planes built here. More than 150 million dollars worth of material was bought from them. Omaha and Council Bluffs firms did subcontract work. It all ended September 30, 1945, when the Martin contract ended. Fly toward the east on the Magic Carpet today and look over part of what makes Omaha the Gateway to the West - its railroad lines. Omaha ranks third or fourth as a railroad center. The clean-lined building standing out in the left foreground is the Union Station. Directly to the right is the Burlington Railroad Station. Nearest the camera is the Burlington Railway Mail Terminal. The Eleventh Street Viaduct is in the foreground. East of it is the Tenth Street Viaduct. The street at right is Mason. Eighty passenger trains daily enter and leave Union Station. Thirty-four draw up at the Burlington Station. The two stations represent an investment of about five million dollars. The Union Station was completed January 15, 1931. There are 110 thousand square feet of floor space in its four floors. The waiting room is 160 feet long, 72 feet wide and 60 feet high. It is owned by the Union Station Company. Actually, it is operated by the Union Pacific Railroad. Six other railroads using it pay their share of its operation cost. They are the Chicago & North Western; Chicago, Minneapolis, St. Paul & Pacific; Chicago, Rock Island & Pacific; Illinois Central, Missouri Pacific and the Wabash. The Burlington Station was built in 1898. It was remodeled, modernized and reopened with fanfare September 1, 1930. It is 90 feet wide and 330 feet long. It consists of the track level and the main floor. The bridge in the background is the third built across the Missouri by the Union Pacific. It is 1,749 feet and one inch in length. The four-story postal building in the right foreground was opened July 1, 1926. It is owned by the Burlington and leased to the Railway Mail Service. It is occupied jointly by the Railway Mail Service and the Postoffice Department. In the left foreground are two more Union Station buildings. The one below the Tenth Street Viaduct level is a carmen's repair shop. The building on the viaduct level is a telegraph instrument shop. Not shown and farther off to the left is the Union Pacific Commissary Building. The Jones Street plant of the Omaha Public Power District is in the left background. The Haskins Soap Company plant is in the right background. Two major Omaha industries come into view when you look west from the Magic Carpet as it floats over the Missouri River. One is the Fourth and Jones Streets plant of the Omaha Public Power District in the left foreground. The other is the alcohol plant of the Farm Crops Processing Corporation at right. The 11 million-dollar power plant has been growing since 1889. At the far left is a construction shack for another $3,600,000 addition. This is the main plant. Another is in South Omaha to serve the packing plants. The people of Omaha have owned the former Nebraska Power Company system since last December 2. The original power building is the lowest section at right in the plant. Many changes have been made. The plant now generates 115 thousand kilowatts. The addition will provide another 30 thousand kilowatts. The plant is now more than a block long. There are eight generators and 14 boilers in the plant. A total of 160 men operate the mass of machinery. Coal is the principal fuel. That can be supplemented with oil or natural gas. There are 50 thousand tons in that coal pile (left) beside the plant. That's a normal pile. Anti-smoke campaigners need not be alarmed by that smoke from the tall stacks. That results infrequently when boilers are being cleaned. The tallest stack towers 250 feet high. The H-like opening on the river bank and the other gap to the north of the barges are water intakes. They draw 150 million gallons daily into the plant. The water is used to condense other water and is not consumed. Another tube, not shown, dumps the water back into the river. Behind the cars on the Burlington tracks in the foreground and to the center of the picture are tanks which chemically treat water used in the huge boilers. That is done so no scale will be deposited in the boilers. Two generating units use as much water daily as is pumped for all Omaha. The Omaha system serves 100 thousand customers, including a segment of Western Iowa and 47 Nebraska towns. The seven million-dollar alcohol plant temporarily is between contracts and on a standby basis. Farm Crops took over the former power plant building of the Omaha & Council Bluffs Street Railway Company which had been idle since 1930. Alcohol production was started February 21, 1944. The plant's product was an important contribution to the synthetic rubber industry during the war. Since the war, Farm Crops has recovered syrup and corn oil. Syrup making was halted when the price of corn, the raw product, became too high. A move is under way for continued operation of the plant by the Government as a permanent part of the synthetic rubber industry. The aim is that this country would always be ready if its imports should again be cut off. The plan envisions the Omaha plant as a research center. Its backers have stressed that the Omaha plant is a key to the problem of farm supplies. Flitting among the arriving and departing planes, the Magic Carpet today looks over Omaha's $5,500,000 Municipal Airport. You are about midfield, looking west over one of the country's finest airfields. The field is supervised by the City Airport Commission, headed by Rudy C. Mueller. The airport is listed as Class 4. The commission is following out an engineering survey made by General Airport Corporation in development of the field. Under that plan, the field will be Class 5 by 1960. The commission expects to obtain Federal dollars to match City funds for the work. 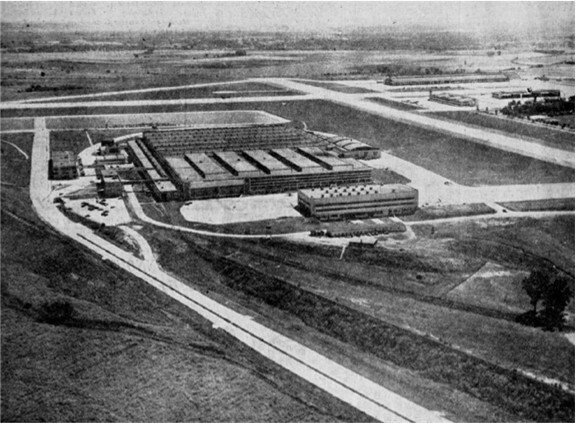 At extreme left is the United Air Lines hangar and commissary building. Nestling next to it is the recently-completed 130 thousand-dollar UAL operations air freight and communications building. In the center is the Administration building. Farther to the right is the Postoffice building. On top of it is the Civil Aeronautics control tower. At its right is the Fire Station, with a boiler room and storage space. Carter Lake is in the background. Visible on its near shore are the Civil Air Patrol classroom and shop. Two scheduled airlines service Omaha. United Air Lines has 25 east-west flights daily. Mid-Continent Airlines, Inc., has 14 north-south flights every day. Omaha is a key point for both carriers. In addition, the City field daily welcomes air cargo carriers. Thousands of lighter planes monthly take off and land. There are five runways. A seven thousand-foot strip is to be added next year. At the same time, the present north-south concrete runway will be lengthened from 5,150 to six thousand feet. For the expansion, the Airport Commission will acquire another one hundred acres by condemnation. That will make the field area 943 acres. Development of the field dates from 1925 when the City bought 192 acres for 189 thousand dollars. The first hangar was built in 1928. The American Legion erected it with 30 thousand dollars raised by public subscription. Omahans apparently are more interested in the unusual than in bigness. That is evident in their attention to the three million-dollar addition to the home of the Mutual Benefit Health and Accident Association and the United Benefit Life Insurance Company. The Magic Carpet dips down above the giant structure on Farnam Street between Thirty-third and Thirty-fourth Streets to show you why. The fifth, sixth and seventh floors of the nine-story addition are being built first. That, said Dr. C.C. Criss, president, and Mrs. Mabel Criss, his wife who is vice-president, is because the present five-story home is overcrowded. Some departments will be moved into the three floors of the new structure December 1. Those will be the department's permanently-assigned quarters. The addition, started in July, 1946, is to be completed next February. You are looking slightly northwest. Farnam Street is in foreground below. Thirty-third is at the right. The "old" building (foreground) was built in 1940 and cost one million dollars. Its Kasota stone and Virginia greenstone facade is being carried out on the addition. A temporary wall separates the "old" building from the addition. The two insurance companies bring 150 million dollars yearly into Omaha from two million Mutual Benefit and 300 thousand United Benefit policyholders. The combined assets of the two firms total nearly 150 million dollars. The 1,675 employees in the "old" building share in the firm's annual Omaha pay roll of $3,033,000. The insurance firms have offices in 150 cities, all served from the Omaha offices. The employee roster is not expected to increase when the addition is occupied. Eighty square feet will be allowed for each employee in the addition. There will be 255 thousand square feet in the addition to augment the 90 thousand in the present home. The new structure will be air-conditioned and will have ionized air. Eighty-five per cent of the bacteria, dust and smoke will be filtered out of the air. As an added health precaution, there will be a complete hospital unit with a doctor and three nurses. The addition also will have an auditorium for company meetings and concerts. It will have a closed circuit broadcasting system. With it, programs can be carried throughout the building, to offices in other cities or as a starting point for radio network programs. The men who keep the Union Pacific trains in operation work in these sprawling shops at Ninth and Davenport Streets. You are looking north. Davenport Street runs laterally in the picture, crossing the tracks. More than 2,500 men are employed here daily. 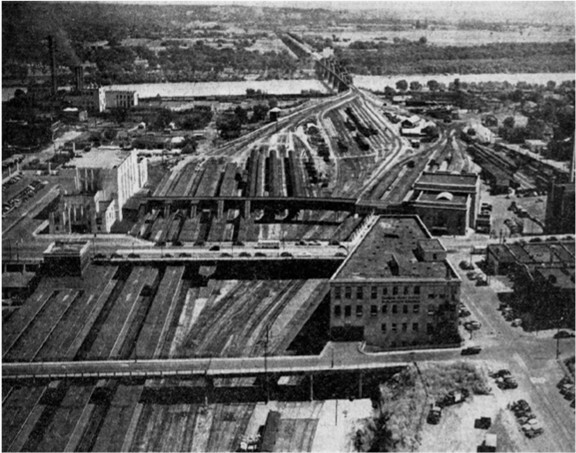 The major shop of the Union Pacific system is in the long building in the center. Two thousand employees work there in two shifts, overhauling and repairing both steam and diesel locomotives. Usually, 12 locomotives are being worked on at once. The structure is 1,007 feet long, 150 feet wide. The railroad's boiler shop also is housed here. At lower left are the switching tracks of several railroads. To the right of them is the U.P. employees' parking area. Looking north is a small roundhouse and turntable for 10 switch engines. To the left behind the roundhouse are warehouses for materials, gasoline, paint. 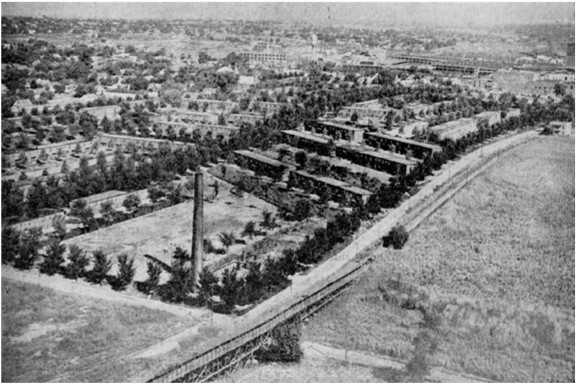 At the extreme left in the picture and shaded by trees is the office of the superintendent of shops and the testing laboratory. At the right of the big main shops building is the new machine shop (nearest front). Back of it is the iron house. The larger structure behind it is the 375-foot-long blacksmith shop. At its rear is the power plant, which also supplies heat to the Union Pacific Headquarters Building. At right of the power plant and blacksmith shop are the paint, wheel and main car shops. The latter has a table four hundred feet long to swing the cars around while being worked on. In the upper right background are the U.P. 's Eighth Street Yards where trains are made up. In the right foreground are team tracks where Omaha freight is unloaded and a dock where refrigerator cars are iced. You are flying north over Peony Park at Seventy-eighth and Cass Streets. 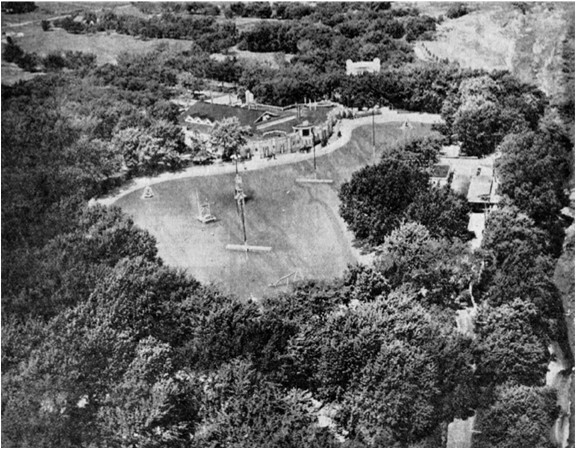 Here are 35 acres of wooded playground, where 7½ million persons have been entertained since the park began in 1920. The pool and surrounding beach take up about 4½ acres. There are five million gallons of filtered, chlorinated water in the lake. It is supplied from artesian wells. The pool is seven hundred feet long. Its width varies from 150 feet to four hundred feet. The depth ranges from one foot for youngsters, to 10 feet for expert swimmers and divers. In the center, on the far side of the lake, is the Royal Terrace Ballroom, "one acre under one roof." In the background, the white building is an open air stage and orchestra shell. This fronts on the Royal Grove, an open air dance floor, which can accommodate three thousand dancers. The open area to the left of Royal Grove has a softball diamond and picnic and recreation grounds. At extreme right are the bath houses, service buildings and refreshment stands. The Missouri River had to be shifted about three thousand feet west to make it flow under this shining span. Army engineers accomplished this task of changing the channel in about six years. This is the South Omaha Bridge. Its Nebraska approach and the tollhouse, based at Thirteenth Street and Missouri Avenue, are at extreme left. You are looking northwest from the Iowa side. 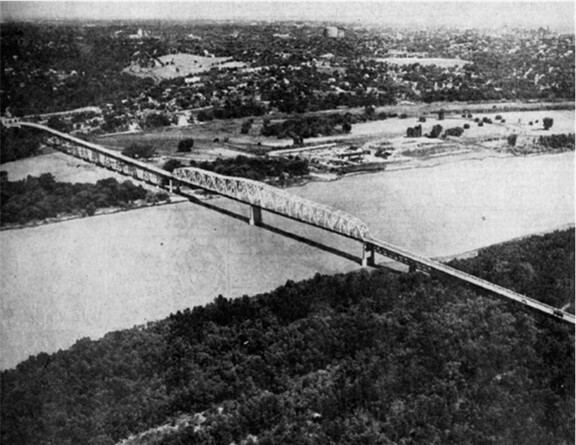 Partly financed by PWA, construction began in 1934, and the bridge was opened to traffic in January, 1936. Its cost, including 5½ miles of highway in Iowa, was $1,729.729.79. The Government aided with a PWA grant of 441 thousand dollars. Under management of the Omaha Bridge Commission, more than 800 thousand dollars had been paid on the indebtedness to September 1, 1947. A balance of approximately 485 thousand dollars is being paid by the Ak-Sar-Ben bridge. Assumption of the debt has hastened the canceling of the obligation by about three years. Both bridges will become free on September 25. There are four hundred tons of steel in the bridge. The two center spans are each 525 feet long. They are 52½ feet above the river. The two-lane roadway is 25½ feet wide. The approach on the Nebraska side, called a deck truss viaduct, is about 1,400 feet long. It is built high over the lowlands as protection against floods. The concrete piling and deck truss viaduct on the Iowa side is about 1,800 feet in length. Back on the bridge on the Nebraska shore is seen a small colony of buildings. 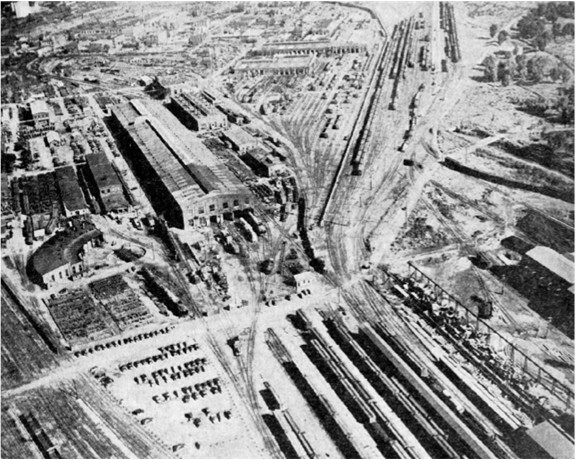 This is a boat yards constructed during the war by the Omaha Steel works. Downtown Omaha is faintly visible in upper right. Swinging back to Omaha after an aerial survey of Council Bluffs, the Magic Carpet flies over the Ak-Sar-Ben Bridge, also known for many years as the Douglas Street Bridge. This is the original span, plus a great many improvements. It officially opened October 30, 1888. It has been widened and reinforced. Steel supports have been added, and the roadway has been replaced. On Thursday, after nearly 59 years of service and a policy of pay-as-you-go, it will become toll free. The final bonds were paid June 30, 1947. Since then the toll charges have helped reduce the indebtedness of the South Omaha Bridge, which also becomes free. This span is 3,263 feet long and is now 40 feet wide. It was 24 feet in width for a long time. Its original cost was 500 thousand dollars. In later years, steel supports and other improvements cost another 700 thousand dollars. Its widening in 1922-24 cost 830 thousand dollars. After Ak-Sar-Ben bought the span in 1939, more improvements cost 265 thousand dollars. Total cost therefore is estimated at $2,300,000. The photo clearly illustrates the fact that big bridges are built diagonally over streams, and never run at right angles to rivers. Douglas street runs due east and west. Part of Omaha's great industrial section is in the foreground on the Nebraska side of the river. 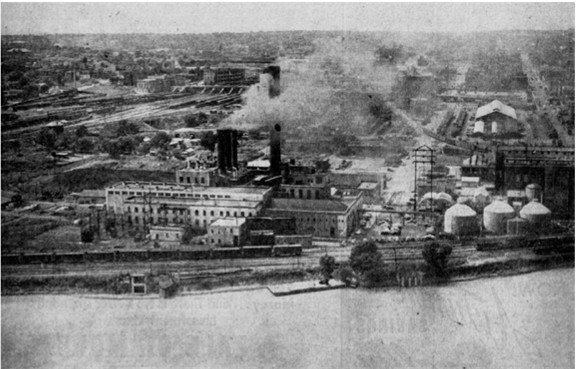 The American Smelting and Refining Company's plant is at extreme right, at river's edge. This is downtown Omaha. The Magic Carpet floats slowly so that you may make a long, leisurely inspection of the heart of the city. Buildings long familiar to you from the ground now have a new perspective. Downtown Omaha is a beehive of activity. Thousands of persons come here daily to work, and to earn 275 million dollars annually. Other thousands come to shop in the stores. Additional thousands of visitors from Nebraska and Iowa and other sections of Omaha's vast trade territory come here to do business and to have fun. This great picture will be the cover of the forthcoming book, "Omaha From the Air." It will also be one of the 45 photos within the book. The entire series of aerial photos was made by World-Herald Photographer John S. Savage. He was piloted by Marion Nelson of the Omaha Aircraft Company.